A recent expansion, the Dust 514 beta, and a relaunch in China all helped to push the MMORPG past 500,000 players worldwide. Sci-fi MMORPG EVE Online, known for its emphasis on corporate dealings, player dynamics, and the occasional mass-starship battle, recently hit a new milestone: CCP Games announced that the game has broken the 500,000 subscriber mark worldwide. CEO Hilmar Veigar PÃ©tursson and CMO David Reid explained in a conference call that, along with 10 years of steady growth, the goal was attributed to the release of the EVE Online: Retribution expansion, as well as the beta for first-person shooter Dust 514, which takes place within the MMO's universe. Reid also suggested that the growth spurt was thanks to a relaunch of the game in China, published by TianCity. All three factors combined to boost subscriber levels since December of last year. In an interview with VG247, Reid said the game experienced fast growth in the east. "It's fair to say that the Western business is larger, but then again it's had ten years to get to the place it is, and we expect to see continued growth in the Chinese market. "The only thing we would call surprising is just how well Chinese gamers took to EVE in a sense, because the Chinese market is a very different one, and there's a lot of free-to-play out there, we're a subscription title. There's a lot of - shall we say - shallower games that are prominent in the market there, and EVE of course is a very deep game." 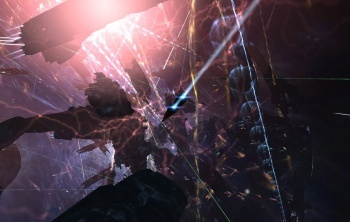 PÃ©tursson claimed that EVE Online's sandbox approach to gameplay, where the state of the game's universe is driven entirely by players, enabled it to retain and attract new participants. "We've often called it the 'infinitely scalable storytelling engine,'" he said, citing The Battle of Asakai as an example of unscripted events causing widespread effects. "As the game grows - for every 100,000 people who join EVE Online, the inherent value of the game becomes a stronger one," he continued. "EVE, with a half a million people playing it, is a much better experience than when we have 300,000 people playing it."